Every once in a while I am tempted to compare myself to someone else. When I start having these kinds of thoughts in my mind I try to immediately take them out because 1) they are not happy thoughts and 2) they are not healthy thoughts. Sure, you can be motivated to change something like a behavior or a habit or some choices because of the example of someone else. That’s different. But when you start comparing yourself to someone else, which in most cases you end up comparing someone’s strengths with your weaknesses, it’s just not fair. Just as much as I try not to compare myself to anyone else but rather be comfortable in my own skin, I don’t like it when others compare themselves to me. Because I wish those people could see themselves like I see them. They are amazing and beautiful, and people who I look up to. The truth is, we each have different lives for a reason, and that’s a good thing. And we should embrace that every. single. day. of our lives. So, in honor of all of these words I have shared with you, I designed this next inspirational quote for women to help us not to compare ourselves to others. Why? 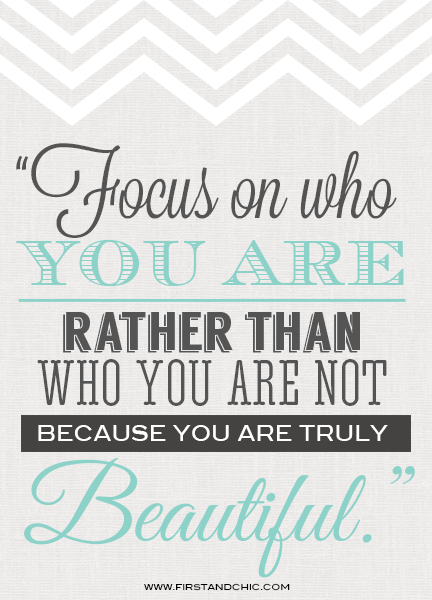 Because we are ALL beautiful. So remember that. An amazing poem called “She” just released today. Boutique owner, fashion and women blog writer, mother to five kiddos, wife to the best man on earth, enjoying this thrilling life. Clearance Sale – 60% OFF + New Style Boards! It’s OUR LAST Cyber Week Daily Deal! Save 40% on all fashion tops! Cyber Week Daily Deal #4 – Save 40% on all accessories! Cyber Week Daily Deal #3!